The easiest way to get young children used to cooking with and eating cheese is to make a tasty dip. This gives them some basic skills such as blending cheeses and arranging vegetables to dip in them. It also encourages them to try eating some different vegetables. 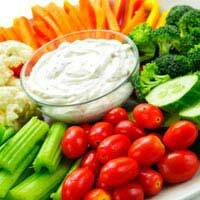 Even the pickiest little eater will try new veggies when they’re presented alongside a dip they’ve made themselves. A quick and easy recipe for when your hungry little workers arrive home. Carrot, celery and cucumber or courgette sticks, cherry tomatoes, pitta bread cut into small slices, tortilla triangles, French bread sliced thinly or low salt pretzels. Beat the cream cheese in a bowl until its soft and flexible, then add the crème fraiche and grated cheese and allow your child to mix them together. Lay out plates or trays and let the children arrange the vegetables and bread items attractively. You can show them how to make a rainbow, or concentric circles. This gets them used to making food look good and gives them experience in handling different shapes and textures. The next step up is macaroni cheese – a real children’s favourite and easy for them to help cook. Heat the oven to 200°C or gas 6. While the oven is heating, put a large pan of water on to boil – when it reaches the boil, put the macaroni in for five minutes. Then drop the broccoli into the pan and cook for a further three minutes. By this time, the broccoli and macaroni should both be tender. Drain the pan and while it is draining, let your child grease an ovenproof dish. Now melt the butter in a pan and stir in the flour – cook it gently for a minute over a medium heat, stirring all the time. Remove from the heat and gradually add the milk, allowing your child to stir the mixture until it is fully blended. Once all the milk is added, return to the heat and bring to the boil, stirring, until the sauce thickens. Take the pan from the heat again and add the mustard and seasoning. Get your child to stir three-quarters of the cheese into the sauce until it is melted. Then let them sprinkle the sweetcorn over the broccoli and macaroni before pouring the sauce over the top, and using a fork to ensure the sauce reaches the bottom of the dish. Scatter the rest over the cheese over the top, and put the dish in the oven for twenty minutes until the topping is golden. Always supervise a young cook when using a knife and putting the baking tray into the oven. Preheat the oven to gas mark 5 or 190°C. Sift the flour into a mixing bowl and give your child a blunt knife to cut the margarine into pieces. When the pieces are pea-sized, add to the flour and show your child how to rub the two ingredients together with their fingertips. Then add the grated cheese, parsley and some salt and pepper and stir together. Break the egg into a cup and let your child beat it a fork – add about half the egg to the flour mixture and bring together with the knife. If necessary add more of the egg until it forms a stiff dough. Wrap this dough in greaseproof paper and put in the refrigerator for half an hour. Flour a work surface and show your child how to roll their rolling pin over the floured surface to coat it in flour. Help your child roll the dough into a rectangle about a centimetre thick before allowing them to cut strips about 8 x 2 cm. You may need to help transfer them to a greased baking sheet. Bake for 15 minutes.